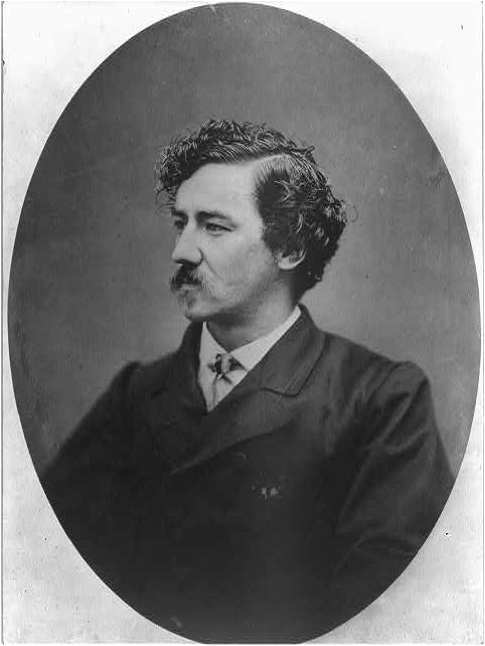 July 11, 1834 James McNeill Whistler is born in Lowell, Massachusetts to Anna Matilda Whistler and her husband, Major George Whistler. 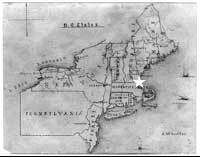 Map of NE United States drawn by James McNeill Whistler. Lowell, MA indicated with a star. Nikolai Gogol’s Dead Souls is published in Russia. 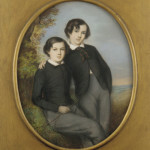 Portrait of J. McNeill Whistler and His Brother William, pastel on paper, courtesy of the Freer|Sackler Galleries of Art. 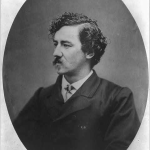 William Edward Kilburn, “James Abbott McNeill Whistler,” 1847-1849, photograph, courtesy Harvard Art Museums. 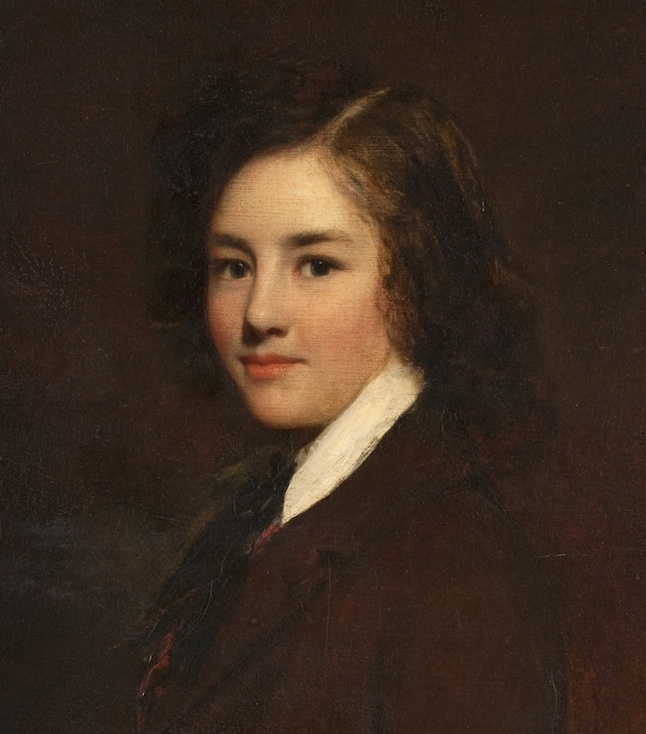 September, 1848 For the sake of his heath and education, young Jemie Whistler is sent to boarding school in Portishead, near Bristol, England. In America, the California Gold Rush begins. The Communist Manifesto is published in London. King Louis-Philippe abdicates, making way for the Second French Republic. Louis Napoleon Bonaparte becomes president. Sir William Boxall, “James McNeill Whistler aged 14,” 1848, oil on canvas, courtesy Hunterian Museum and Art Gallery, Glasgow. 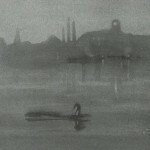 April, 1849 Major George Whistler dies of complications brought on by the cholera epidemic that has swept St. Petersburg. 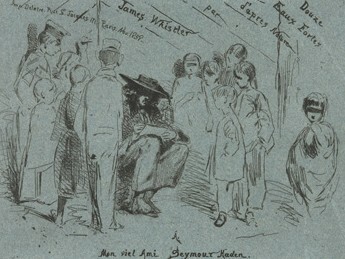 Anna Whistler returns to America with her sons James and William. Publication of Edgar Allen Poe’s Annabel Lee. “Portrait of Major Whistler,” ca.1857-1859, oil on canvas, courtesy Freer Gallery of Art. 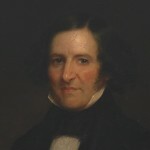 July, 1851 “Jemmie” Whistler enters West Point. Fellow cadets dub him “Curly” for the lock of hair that often falls in his face. Drawing is his most successful academic effort. Artist J.M.W. Turner is buried next to Sir Joshua Reynolds at St. Paul’s Cathedral. The Second French Empire begins when Louis Napoleon Bonaparte declares himself Napoleon III. 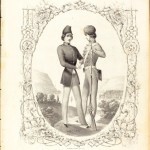 “Merit Its Own Reward,” drawing: pen, black ink and ink wash; courtesy of the Library of Congress. Harriet Beecher Stowe’s Uncle Tom’s Cabin is published; it will become the best-selling novel of the 19th-Century. 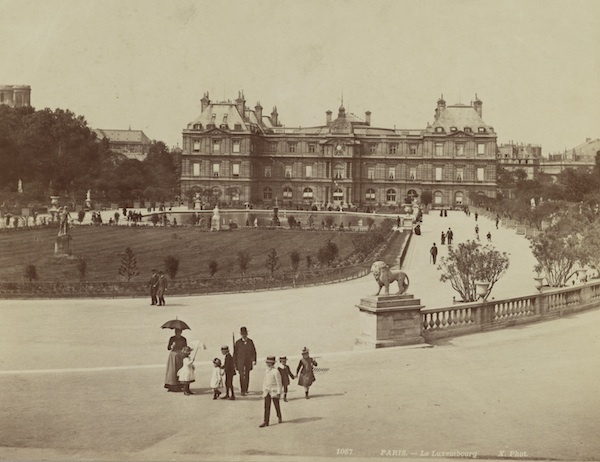 Napoleon III hires Georges Haussman to re-design the boulevards, parks and public works of Paris. 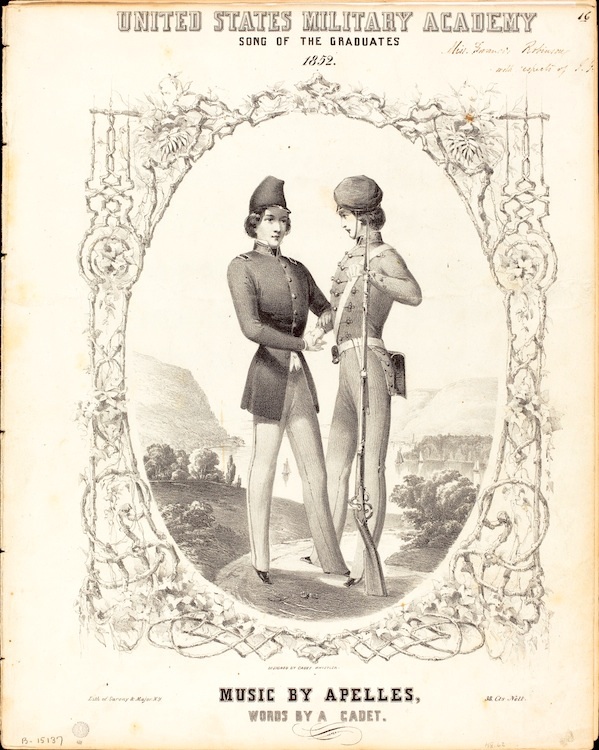 “USMA, Song of the Graduates,” 1852, lithograph, Rosenwald Collection; courtesy National Gallery of Art. 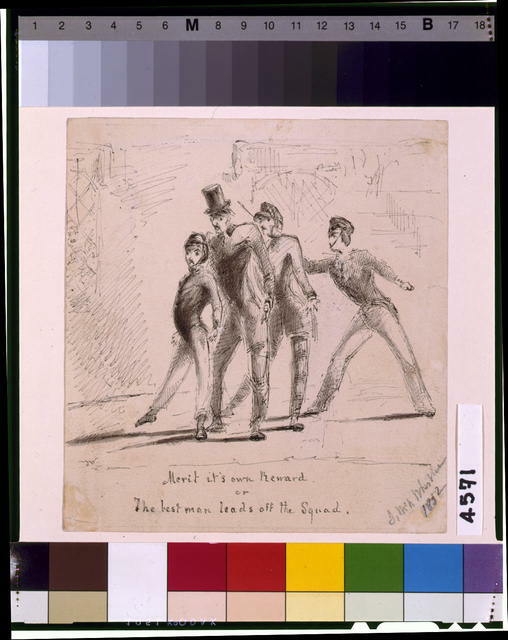 June 16, 1854 Whistler is discharged from West Point for an accumulation of demerits. 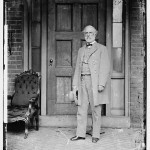 Superintendent Robert E. Lee rejects his appeal to stay. Commodore Matthew C. Perry arrives in Japan with his fleet, demanding the right to trade. After 250 years of dealing exclusively with the Dutch, Japan will trade with the U.S. and other nations. 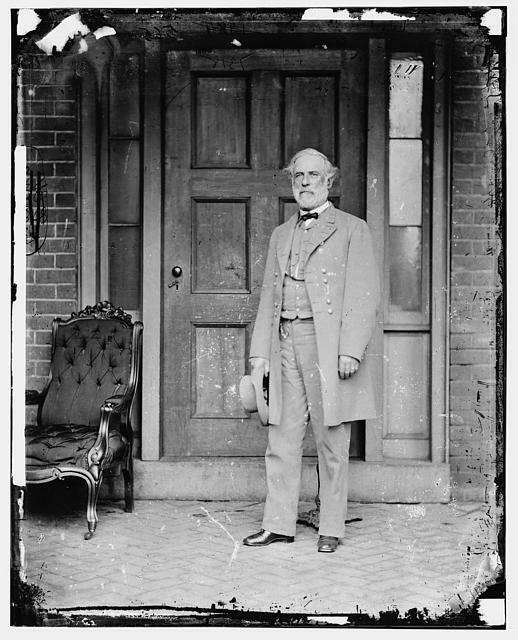 Robert E. Lee, Superintendent at West Point Academy, courtesy of the Library of Congress. 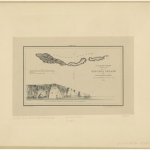 “Anacapa Island,” etching on paper, courtesy of the Library of Congress. February 12, 1855 Bored by mapmaking, Whistler resigns from the Coast Survey. He will head to Paris to study art and live the life of a bohemian artist, as described in Henri Murger’s Scènes de la vie de Bohème. Russian Tsar Nicholas I dies and is succeeded by Alexander II. 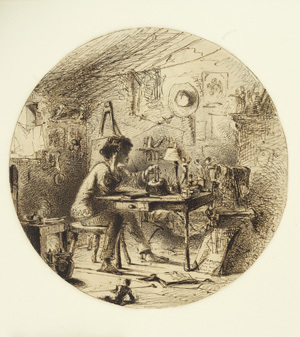 “An Artist in his Studio,” pen and ink on paper, courtesy of the Freer|Sackler Galleries of Art. 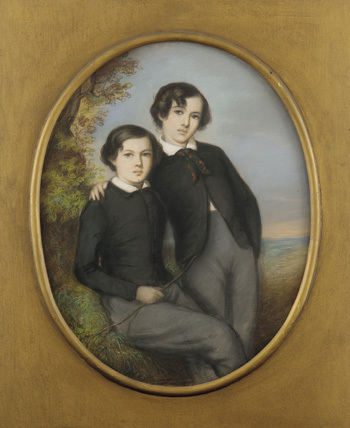 “La Mère Gérard,” 1855, oil on panel, courtesy Colby College Museum of Art. 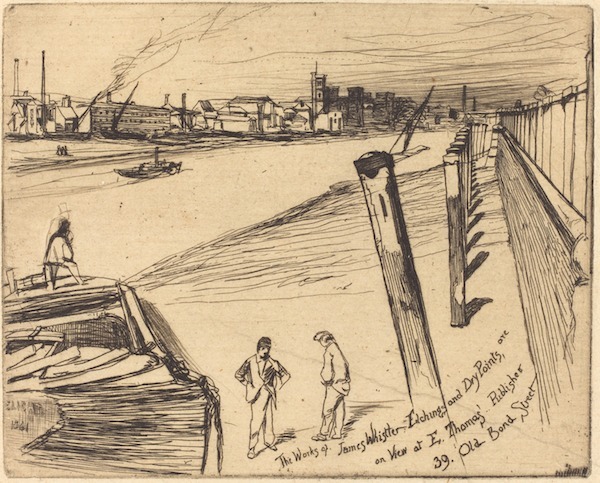 August, 1858 With his friend Ernest Delannoy, Whistler travels through the Rhineland to draw and etch. 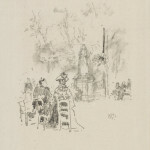 The result is “The French Set” of etchings, a collection of views of everyday subjects drawn from urban and rural life. 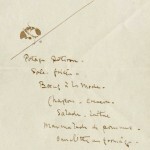 Publication of “The French Set” marks the beginning of his artistic career. 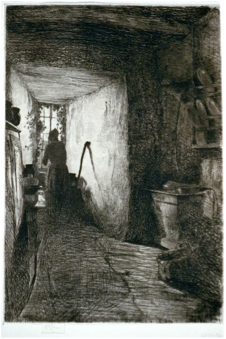 “The Kitchen,” etching on paper, courtesy of the Library of Congress. “The French Set Title Page,” etching on paper, courtesy of the Freer|Sackler Galleries of Art. 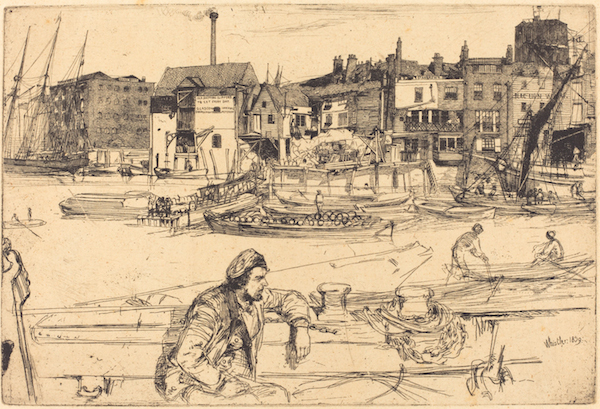 May, 1859 Whistler moves to London, writing his friend Henri Fantin-Latour that it “welcomes young artists with both hands.” He takes rooms in a working class neighborhood along the polluted and industrialized Thames, making etchings of life along the river. He embraces the views of Charles Baudelaire and Gustave Courbet, who has urged artists to celebrate the dignity of everyday life. Charles Darwin’s The Origin of the Species is published in England. 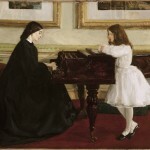 July, 1860 Whistler’s picture At the Piano, begun two years earlier, is accepted at the prestigious Royal Academy exhibition. The Academy’s president says it is the best picture in the show. Whistler is 26 years old. Abraham Lincoln elected President of the United States. Publication in England of Charles Dickens’ Great Expectations. 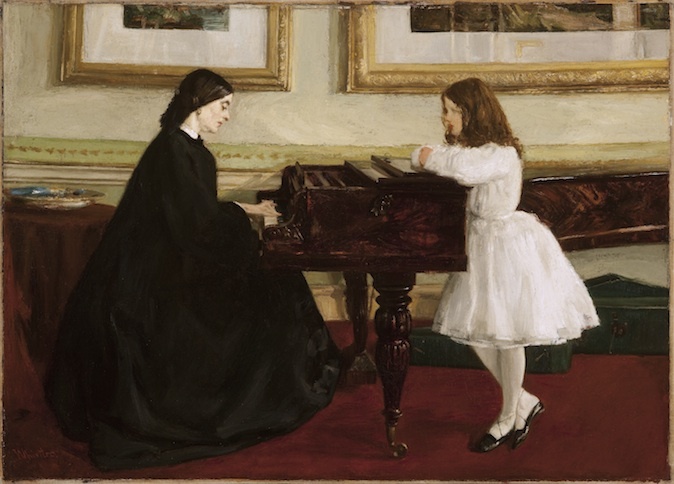 “At the Piano,” 1860, oil on canvas, courtesy Taft Museum of Art. 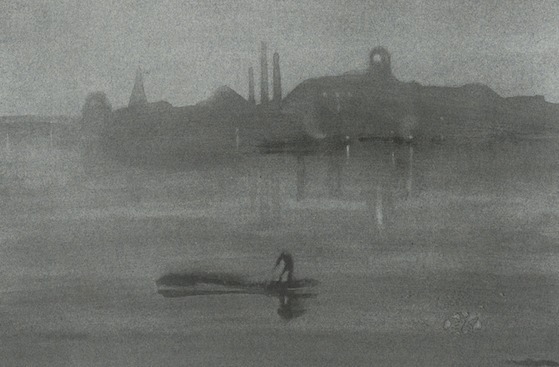 December, 1860 On Christmas Day, Whistler begins The Thames In Ice, a landscape of the frozen river. He paints it, he claimed, in three days. Two years later it will be accepted for the Royal Academy exhibition. But another picture, The White Girl, which suggested a new direction for his art, will not. 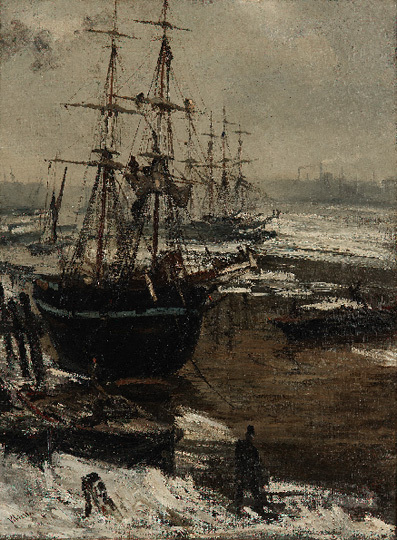 “The Thames in Ice,” oil on canvas, courtesy of the Freer|Sackler Galleries of Art. 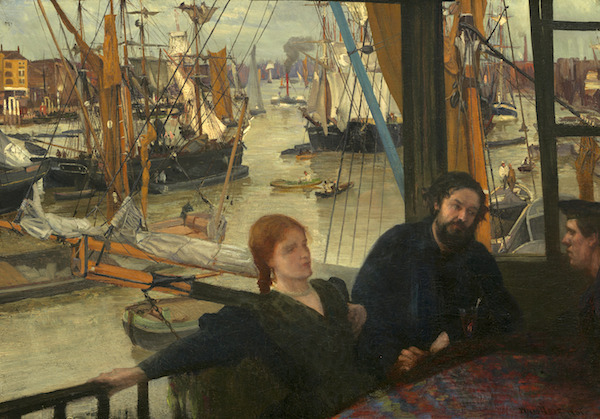 July 11, 1861 Whistler takes Joanna Hiffernan, his red-haired mistress and the model for his Realist work Wapping, to Paris where he meets Edgar Degas and Ã‰douard Manet. He begins a new painting, The White Girl, in his rented room, while not shopping for fashionable clothes for Jo and himself. Shots are fired on Fort Sumter, starting the Civil War. In Russia, Alexander II emancipates more than 23 million serfs, and gives them full rights of free citizens. May, 1862 Whistler’s White Girl, rejected by the Academy in London and the Salon competition in Paris, is accepted by the infamous Salon des Refusés, along with works by Manet, Cezanne and Pissarro. 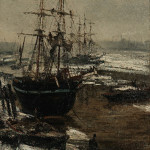 His picture is admired by Manet, Courbet and Bracquemond, but back in London it is panned by the art press. Whistler responds, sending the first of what will be a lifetime of piercing retorts to the media, using wit and sarcasm to bring attention to himself — and to his art. An International Exhibition opens in London and displays objects from China and Japan. “Symphony in White, No.1: The White Girl,” 1862, oil on canvas, 213×107.9 cm, Harris Whittemore Collection, courtesy National Gallery of Art. 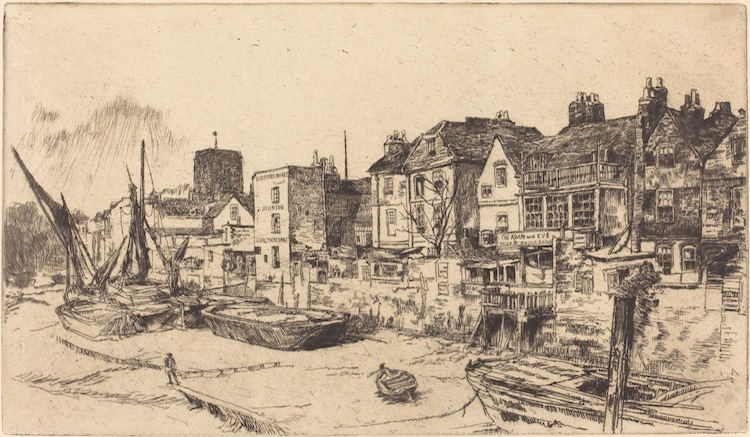 March, 1863 Whistler settles along the river in Chelsea, and will live in the neighborhood for 16 years. 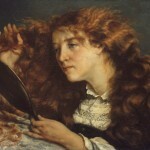 Soon after his arrival, he meets Pre-Raphaelite painter Dante Gabriel-Rosetti and poet Algernon Swinburne, with whom he shares a developing “art for art’s sake” philosophy. He also meets industrialist Richard Leyland, who will become a patron. Napoleon III orders the creation of a “Salon des Refusés after a record 3,000 works are rejected by the Paris Salon. “The Adam and Eve, Old Chelsea,” 1878, etching, courtesy National Gallery of Art. December, 1863 Whistler begins to include the Japanese objects and fine blue-white china he is collecting in his paintings. 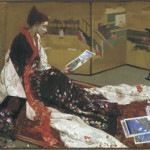 “The Princess from the Land of Porcelain,” oil on canvas, courtesy of the Freer|Sackler Galleries of Art. 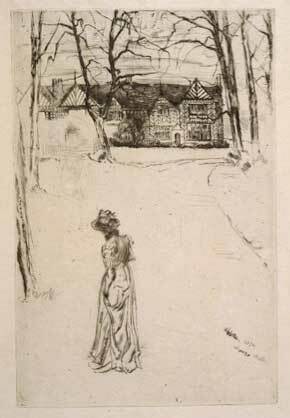 Winter, 1863 Whistler’s social life is abruptly curtailed with the arrival of his mother from America. Anna Whistler has fled the war-torn South to join her son in London. 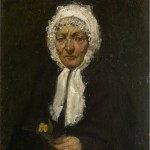 Joanna Hiffernan, Whistler’s mistress and an artist herself, is moved to a house in Fulham, returning during the day to model. 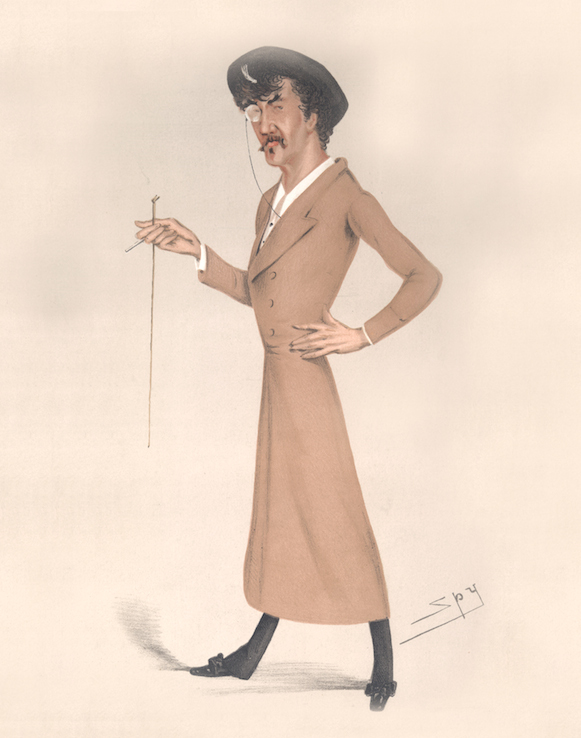 According to one of his friends, Whistler is “utterly miserable,” living, “in respectability” at age 30. 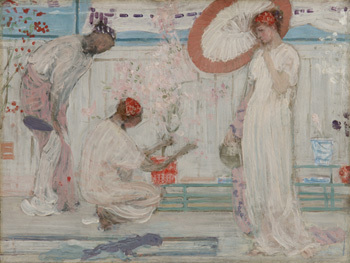 Anna MacNeill Whistler, courtesy of the Freer|Sackler Galleries of Art. “Jo’s Bent Head,” drypoint on paper, courtesy of the Library of Congress. 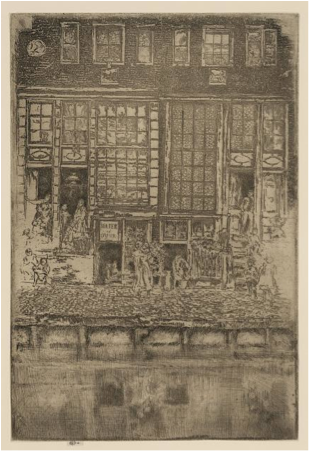 February, 1864 Whistler begins working on The Balcony. He is deeply in need of cash, living beyond his means, asking friends and patrons for loans. As he becomes aware of the prints of Japanese ukiyo-e artists Utagawa Hiroshige and Katsushika Hokusai, his interest in the art of Japan expands from the decorative to principals of composition. 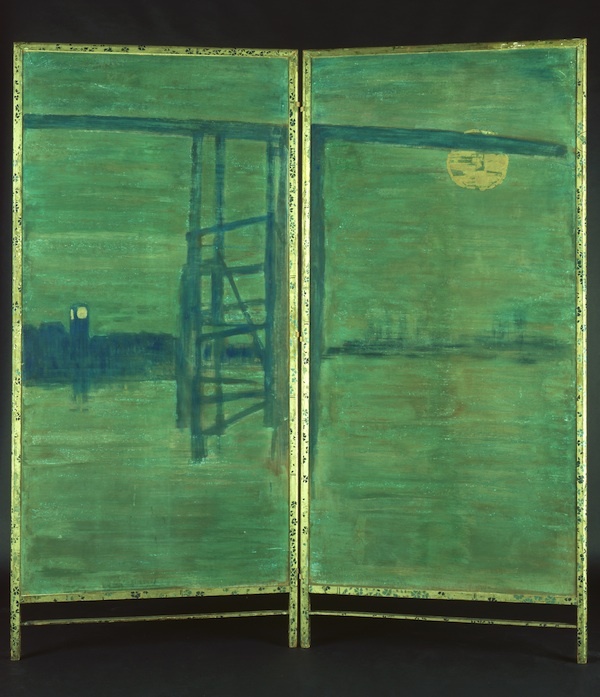 “Variations in Flesh Colour and Green: The Balcony,” oil on wood panel, courtesy of the Freer|Sackler Galleries of Art. 1864 Whistler complains to Fantin-Latour that his work is not going well. “There are times when I think I have learned something — and then I am altogether discouraged.” He produces so little, he says, because he scrapes off so much. “The White Symphony: Three Girls,” c. 1868, oil on millboard mounted on wood panel, 46.4 x 61.6 cm, courtesy Freer Gallery of Art. Lee surrenders to Grant at Appomattox Court House. Lewis Carroll’s Alice’s Adventures in Wonderland is published in London. 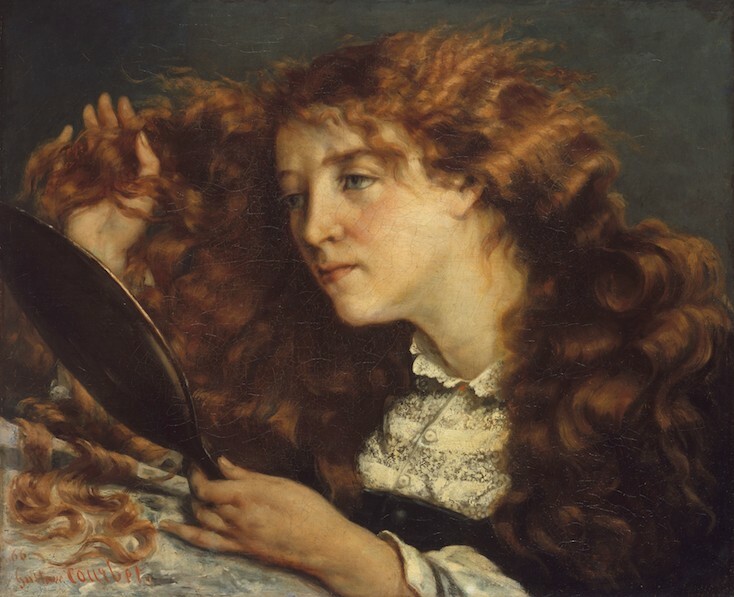 Gustave Courbet, “Jo, La Belle Irlandaise,” 1865-1866, oil on canvas, courtesy Art Resource/The Metropolitan Museum of Art. January, 1866 Whistler joins a gun running expedition to Chile organized by a former West Point friend to help in the war for independence and with the hopes of making money. Whistler makes a will in Joanna Hiffernan’s favor and gives her power of attorney to manage his affairs while he is gone; they will part amicably on his return.The entourage arrives in Chile too late. Whistler returns to England without the money he had hoped to make, further frustrated by having no clear direction for his art. He returns more outward, but also more belligerent. 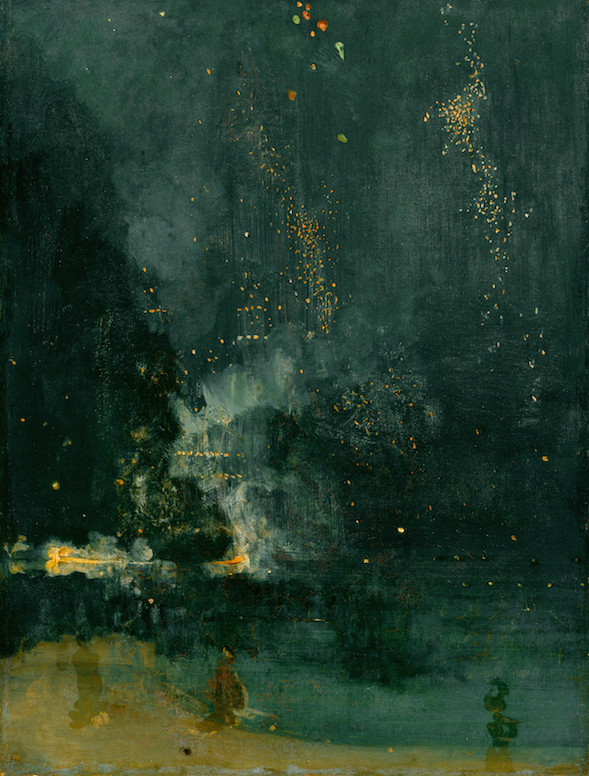 “Nocturne in Blue and Gold: Valparaiso,” oil on canvas, courtesy of the Freer|Sackler Galleries of Art. 1867 Whistler is entering his least productive years. He writes Fantin-Latour that he regrets his youthful indolence in Paris. He bemoans the “terrible lack of education I feel I have had!” ”I will make up for the time I’ve wasted, “he writes, “but what a punishment!” Rejecting Realism, he begins to use perspective differently. The United States buys Alaska from the Russian Empire. 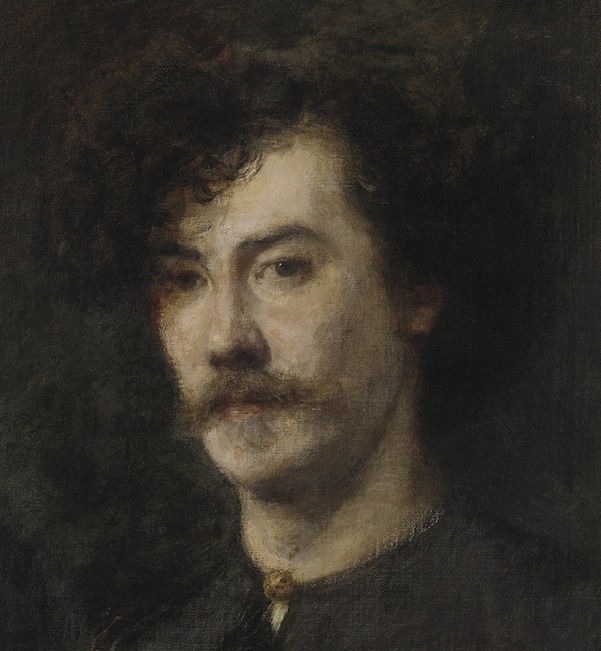 Henri Fantin-Latour, “Portrait of Whistler,” 1865, oil on canvas mounted on aluminum panel. May, 1867 Whistler begins titling his pictures with musical terms. The Balcony now becomes Variations in Flesh Colour and Green: The Balcony. The Golden Screen becomes Caprice in Purple and Gold: The Golden Screen. The critics are confounded. “Caprice in Purple and Gold: The Golden Screen,” oil on wood panel, courtesy of the Freer|Sackler Galleries of Art. 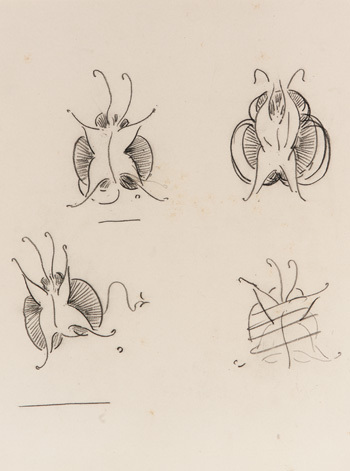 May, 1869 Whistler designs a monogram in the form of a butterfly, which he uses as his signature. Sometimes in his correspondence he includes a barbed tail to indicate displeasure. Susan B. Anthony and Elizabeth Cady Stanton found the National Woman Suffrage Association. Leo Tolstoy’s War and Peace is published and sells out almost immediately. “Speke Hall, No. 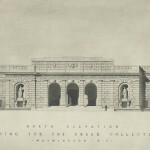 1,” etching on laid paper, courtesy of the Library of Congress. 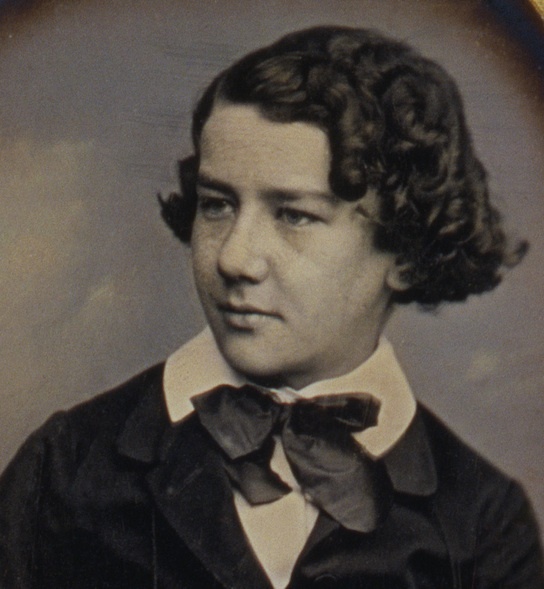 June, 1870 Louisa Hanson, a parlor-maid, gives birth to Whistler’s first child, Charles James Whistler Hanson. 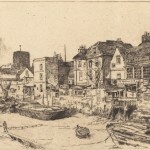 Spring, 1871 Whistler publishes Sixteen Etchings of Scenes on the Thames, the etchings that had been drawn over 10 years earlier. In the wake of the Franco-Prussian War, the Second French Empire ends and the Third French Republic begins. 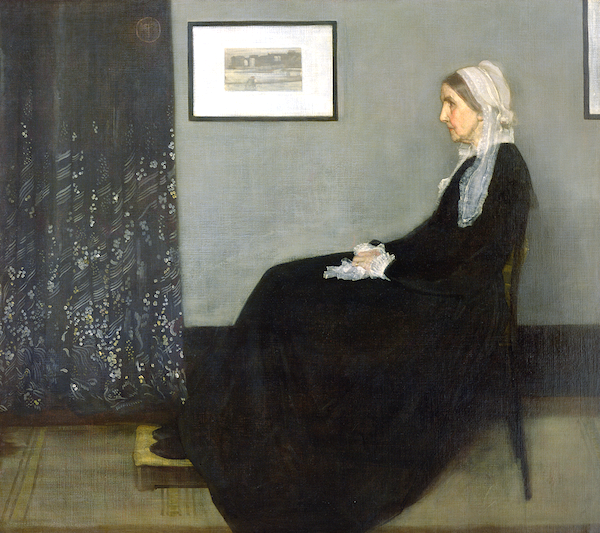 Summer, 1872 Whistler begins a portrait of his mother in the summer, much to her surprise. According to Mrs. Whistler, “he said to me: ˜Mother I want you to stand for me! It is what I have long intended & desired to do, to take your Portrait.’” Arrangement in Grey and Black No.1, A Portrait of the Artist’s Mother, almost as well known as the Mona Lisa, becomes the subject of cards, cartoons, stamps and comic books around the world. Even recruitment posters. 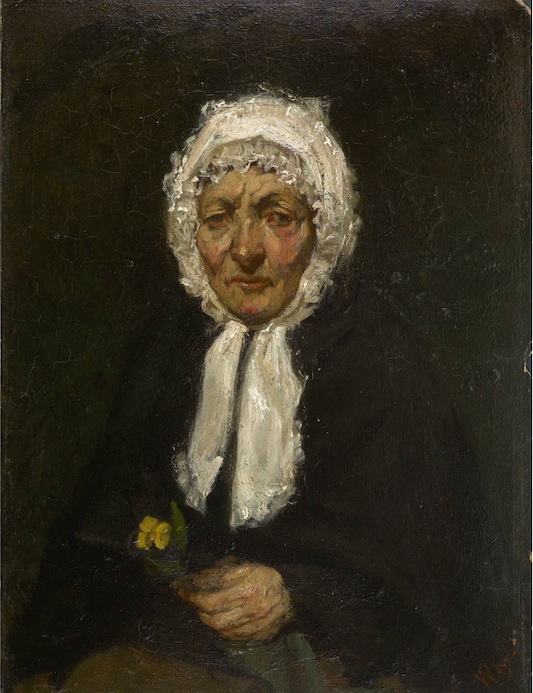 “Arrangement in Grey and Black No.1, Portrait of the Artist’s Mother,” 1871, oil on canvas, courtesy of the Musée d’Orsay, Paris, France. 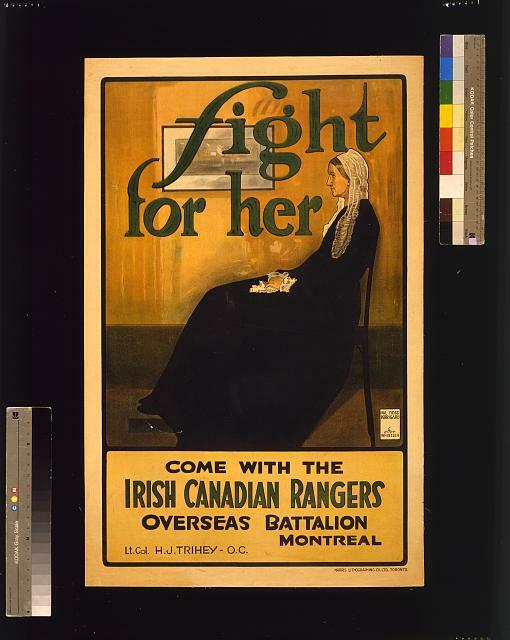 Canadian WWI Recruitment Poster. Courtesy of the Library of Congress. 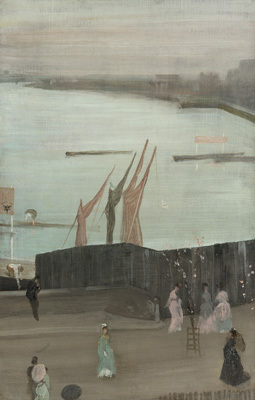 1872 Applying the techniques learned from studying Japanese woodblock prints, Whistler begins to paint a succession of impressions of the Thames. 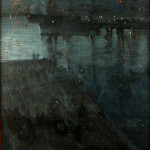 He calls these pictures “moonlights.” Frederick Leyland will suggest the musical term “Nocturnes.” Whistler is delighted as the term “does so poetically say all I want to say and no more than I wish.” His Nocturnes will come to be viewed as an important achievement that pushed painting in the direction of abstraction. 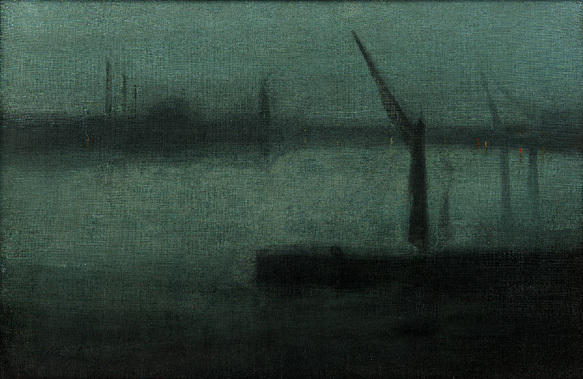 “Nocturne: Blue and Silver–Battersea Reach,” c.1870-1875, oil on canvas, 49.9×72.3 cm, courtesy Freer Gallery of Art. 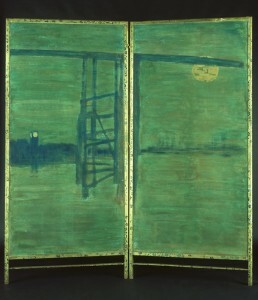 “Blue and Silver: Screen, with Old Battersea Bridge,” 1871-1872, Distemper and gold paint laid on canvas stretched on back of silk, courtesy Hunterian Museum and Art Gallery, Glasgow. 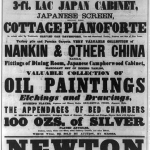 August, 1875 On doctor’s orders, Whistler’s mother moves to Hastings. Whistler, taking advantage, begins to entertain lavishly. “Menu, November 8,” n.d., brown ink on paper, courtesy Library of Congress. 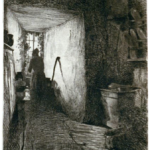 March, 1876 Whistler is hired by Frederick Leyland to design the staircase for his home at 49 Prince’s Gate. The project expands to include decoration of the dining room that will hold Leyland’s collection of blue-and-white porcelains. 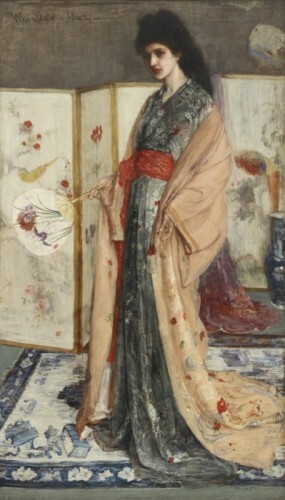 Whistler is a good choice for Leyland; Whistler’s early interest in Chinese porcelains has made “blue-and-white” fashionable in London.With Leyland’s permission, Whistler makes some changes to the “Peacock Room” to better show off the Whistler painting Princess in the Land of Porcelain which will hang there. Then, Whistler makes further changes without Leyland’s permission. The two argue; Leyland agrees to pay half of Whistler’s bill, but no more. 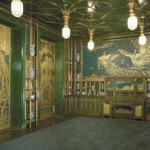 Whistler completes the room, adding a mural of “fighting peacocks” to depict their quarrel over money. 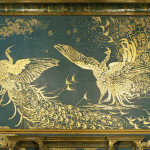 “Harmony in Blue and Gold: The Peacock Room,” oil paint and gold leaf on canvas, leather and wood; courtesy of the Freer|Sackler Galleries of Art. 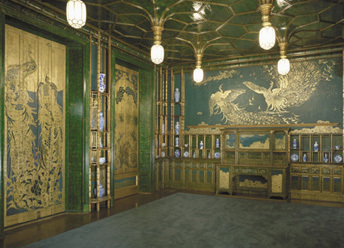 “Harmony in Blue and Gold: The Peacock Room,” 1876-1877, oil paint and gold leaf on canvas, leather, and wood; courtesy Freer Gallery of Art. 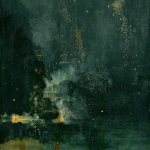 “Nocturne in Black and Gold, the Falling Rocket,” 1875, oil on panel, courtesy Detroit Institute of Arts, Gift of Dexter M. Ferry Jr.
May, 1877 Whistler is invited to participate in a group show at the newly opened Grosvenor Gallery. 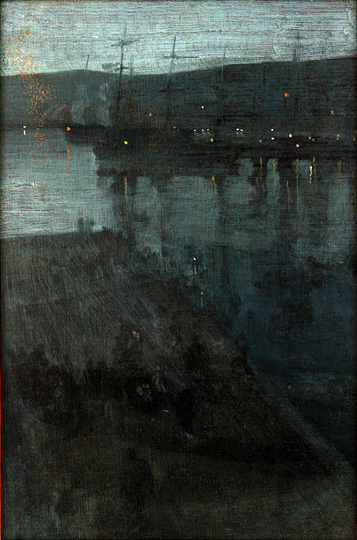 His includes a portrait of his mistress, Maud Franklin, but also a painting of Cremorne Gardens at night, which he called Nocturne in Black and Gold: The Falling Rocket. 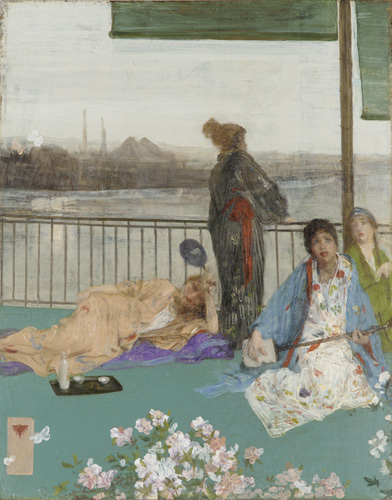 When critic John Ruskin accuses Whistler of “flinging a pot of paint in the public’s face,” Whistler sues for libel. “Arrangement in White and Black (Maud Franklin),” oil on canvas, courtesy of the Freer|Sackler Galleries of Art. November, 1878 Whistler v. Ruskin is argued for two days. 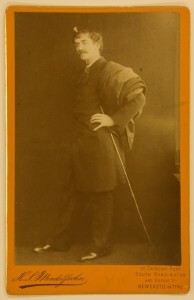 When asked if Whistler is seeking payment for the work of two days, he responds “No, I ask it for the knowledge I have gained in the work of a lifetime.” The jury finds for Whistler, but awards him a mere farthing, not the £1,000 he had requested.Whistler’s mistress Maud Franklin is now eight months pregnant. 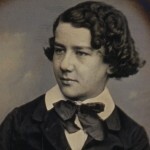 She will give birth early the next year to a daughter, Maud McNeill Whistler Franklin. May, 1879 Whistler goes briefly into hiding. Hounded by creditors, he stays in the studio painting, completing canvasses and hoping for commissions to pay off his debts. He sells paintings, etchings, his porcelain collection, Japanese items and other household effects. He destroys many works of art that he does not want in the hands of creditors. He is forced to give up the house he has designed with architect E.W. Godwin. 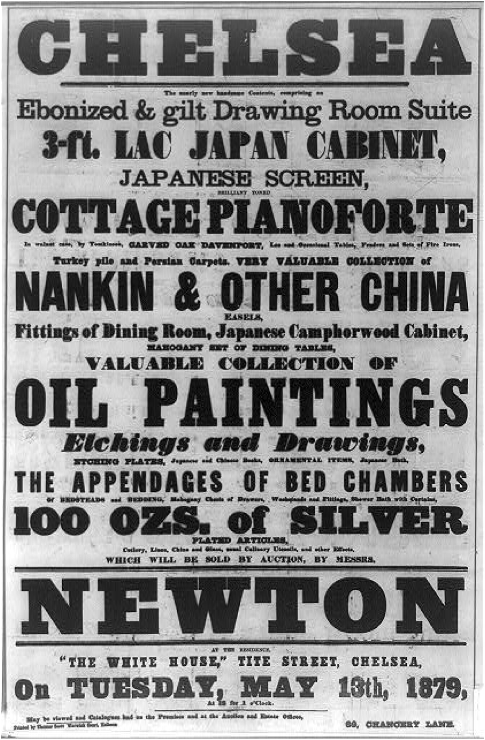 Whistler Bankruptcy Auction Poster, 1879; courtesy of the Library of Congress. 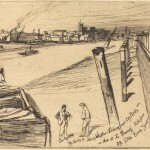 September, 1879 Commissioned by the Fine Art Society to make a series of 20 etchings in Venice, Whistler leaves for that city with a planned return to London in four months. He writes his mother that he is going to attempt to “turn copper into gold.” To the dismay of the Society he stays 15 months. 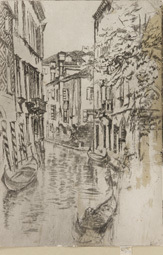 “Nocturne (Venice),” etching with drypoint, courtesy of the Library of Congress. 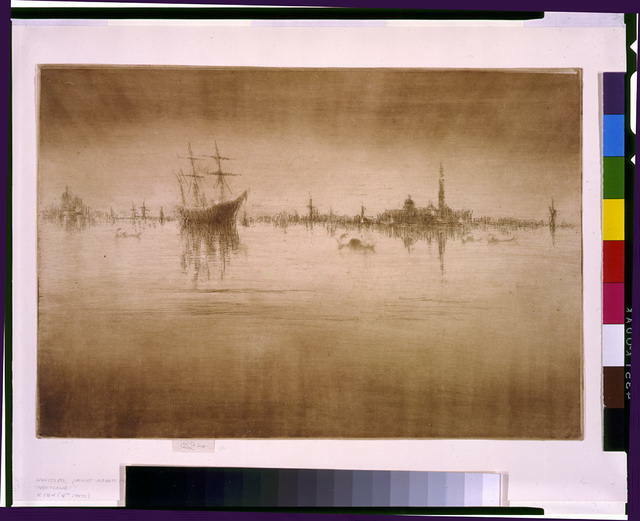 “Nocturne (Venice) Cancelled Plate,” courtesy of the Library of Congress. 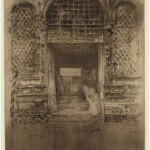 “The Doorway,” etching and drypoint on paper, courtesy of the Freer|Sackler Galleries of Art. The publication in New York of Henry James’ Portrait of A Lady. 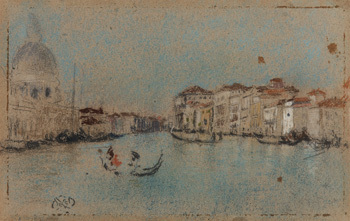 “The Grand Canal, Venice,” pastel on tan paper, courtesy of the Freer|Sackler Galleries of Art. 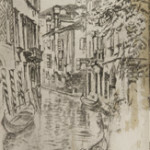 February, 1883 A Second Set of Venice etchings go on display at the Fine Art Society. Whistler calls the exhibition Arrangement in White and Yellow. 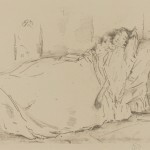 The show is celebrated for Whistler’s exquisite, ethereal etchings, but also for its yellow and white walls, carpeting, furniture and witty catalogue, which sold “like wildfire.” Moreover, Whistler charges admission. 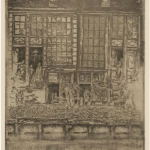 “Quiet Canal,” etching on paper, courtesy of the Freer|Sackler Galleries of Art. 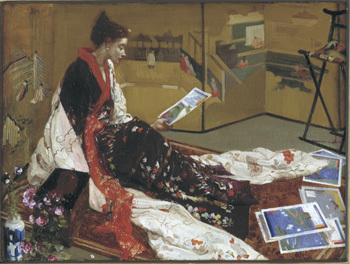 May, 1884 Whistler’s first large watercolor show, Notes-Harmonies-Nocturnes, is presented at Dowdeswells Gallery.As before, Whistler decorated the room to show his work to best advantage. The walls and ceiling are warm flesh color; the carpet is grey. Once again, Whistler is the talk of London. His approach to display revolutionizes the manner art would be hung in private and public view. 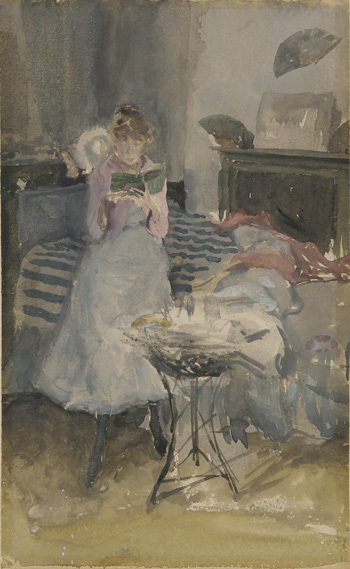 “Pink Note: The Novelette,” watercolor on paper, courtesy of the Freer|Sackler Galleries of Art. 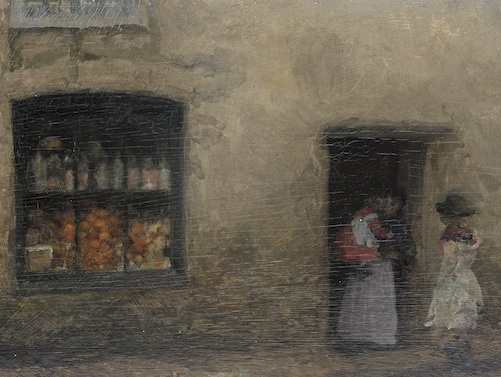 “An Orange Note: Sweet Shop,” 1883-1884, oil on wood panel, courtesy Freer Gallery of Art. February, 1885 With his reputation ascending, Whistler decides to deliver a statement about his philosophy of art. He is now 51 years old. His “Ten O’Clock” Lecture is to be the artistic opening of the social season. The 800 seats at Prince’s Hall are filled with â€˜fashionable, literary and artistic London. The Lecture is noteworthy for its proclamations on art; it also criticizes two good friends, Oscar Wilde and Algernon Swinburne. Their friendships with Whistler — as with so many friends before — ends. The Washington Monument is completed. 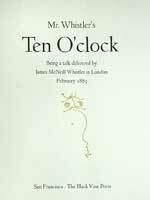 “Ten O’Clock Brochure,” courtesy of the Freer|Sackler Galleries of Art. 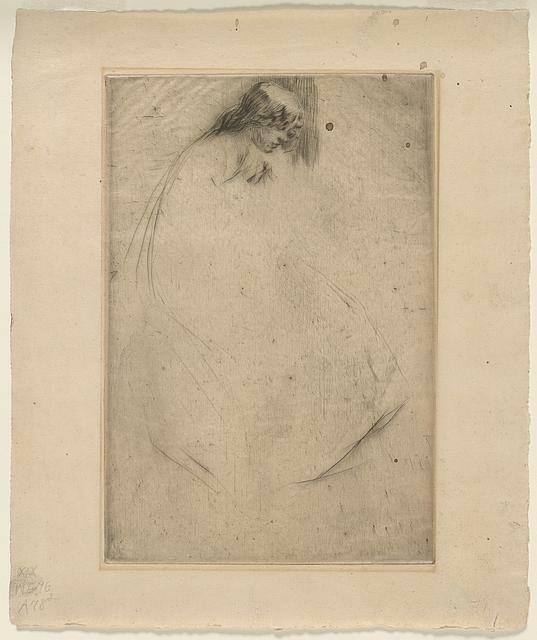 James McNeill Whistler, Half Length Portrait, 1885; courtesy of the Library of Congress. 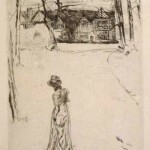 Summer, 1888 Having lived with Maud Franklin for 15 years, Whistler abruptly abandons her for 31 year-old Beatrix Godwin, the widow of his architect. A local headline would read “Butterfly Chained At Last!” His friends are furious over the treatment of Maud. Vincent van Gogh moves to Arles, calling Provence “the Japan of the South” and completes over two hundred paintings. “Harmony in Red: Lamplight,” 1884-1886, oil on canvas, courtesy Hunterian Museum and Art Gallery, Glasgow. 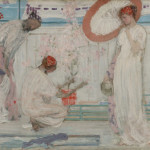 March, 1889 An exhibition of Whistler’s oils, watercolors and pastels in New York at Wunderlich’s Gallery makes an impression on American collectors, especially Charles Lang Freer of Detroit, who will ultimately donate his vast collection of works by Whistler to the Smithsonian Institution. The Eiffel Tower is erected in Paris; it is the main attraction of the 1889 World’s Fair. 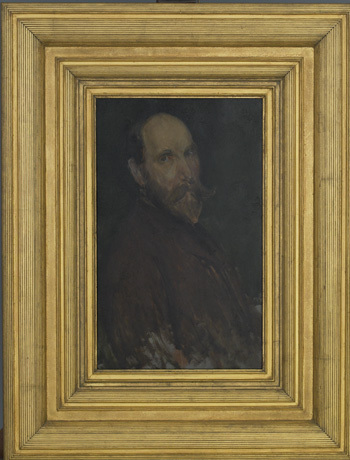 “Portrait of Charles Lang Freer,” oil on wood panel, courtesy the Freer|Sackler Galleries of Art. 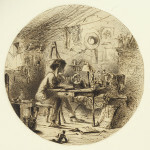 “The Embroidered Curtain,” etching on paper, courtesy of the Library of Congress. 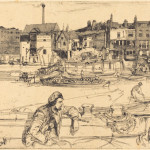 June, 1890 Having collected press clippings written about his work since the 1860s, Whistler compiles the “best” as well as his several writings about art, and his version of the Ruskin trial in a volume with the saucy title The Gentle Art of Making Enemies. 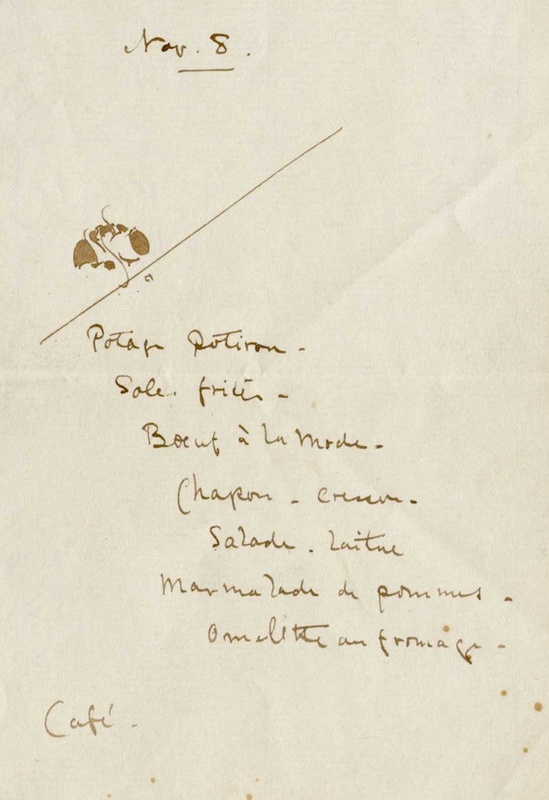 He dedicates it “To the rare Few, who, early in Life, have rid Themselves of the Friendship of the Many…” and illustrates his publication with his trademark butterflies. “Four Butterflies,” crayon on paper drawn for publication of The Gentle Art of Making Enemies; courtesy of the Freer|Sackler Galleries of Art. 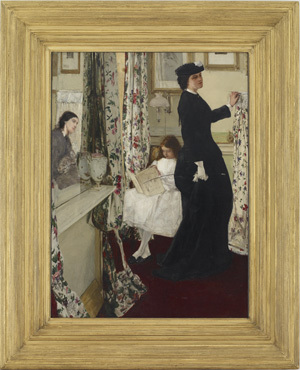 April, 1891 Whistler’s portrait of Sir Thomas Carlyle, Arrangement in Grey and Black, No 2: Portrait of Thomas Carlyle, becomes the first of his paintings to enter a public museum (Glasgow); six months later Arrangement in Grey and Black: A Portrait of the Artist’s Mother is purchased for the Musée du Luxembourg in Paris. 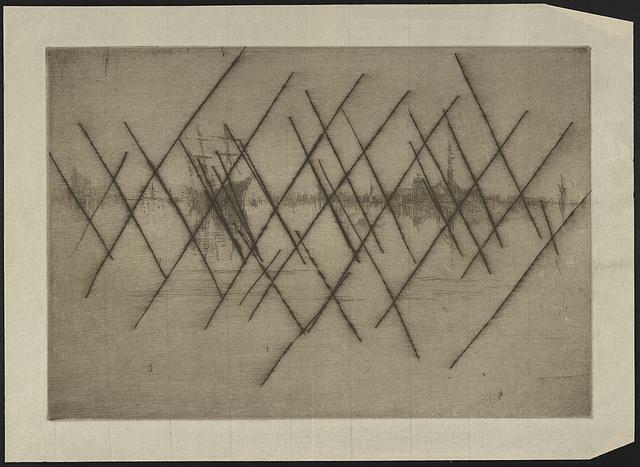 March, 1892 An important retrospective exhibit of Whistler’s work is held at the Goupil Gallery, London. 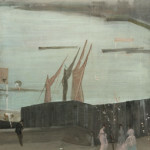 The show is a success, exhibiting Variations in Flesh Colour and Green:The Balcony, Nocturne in Blue and Gold: Valparaiso Bay, and Nocturne: Blue and Silver–Battersea Reach among many others. Whistler receives more commissions than he can fill, and early buyers of his art rush to sell their work for large profits. 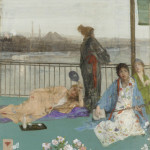 Angered by the “betrayal” of these collectors, Whistler moves to Paris, determines that his work should not stay in England, and encourages its purchase by collectors such as Charles Freer. 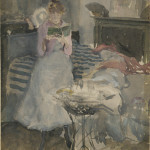 “Variations in Pink and Grey, Chelsea,” oil on canvas, courtesy of the Freer|Sackler Galleries of Art. “Harmony in Green and Rose: The Music Room,” oil on canvas, courtesy of the Freer|Sackler Galleries of Art. September, 1892 The Whistlers move to the rue du Bac in Paris, counting among their friends American artist Augustus Saint-Gaudens, English artist John White Alexander and a group of American art students. 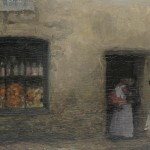 Whistler’s studio is nearby. He makes designs for Stéphane Mallarmé’s recreations postales. 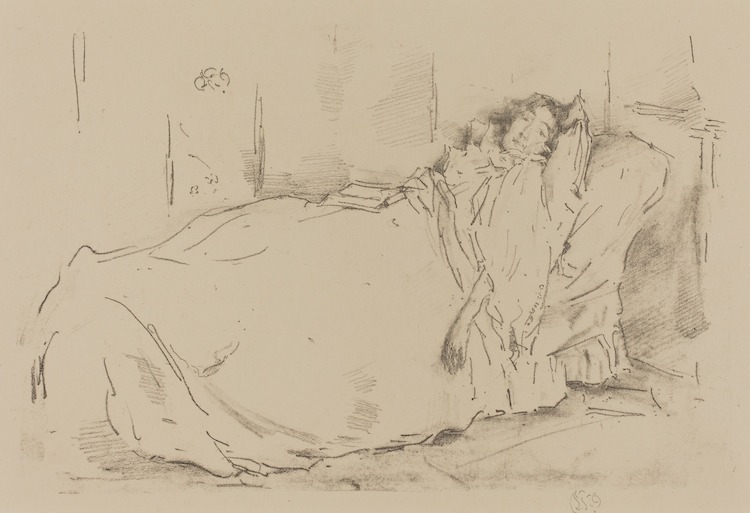 Beatrice encourages Whistler to take up lithography; and he creates a series that reflects their contented life together. 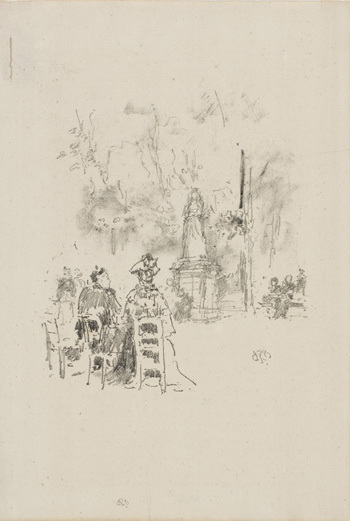 “Conversation under the Statue, Luxembourg Gardens,” lithograph on paper, courtesy of the Freer|Sackler Galleries of Art. 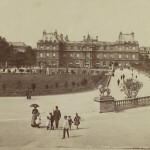 March, 1894 George Du Maurier’s novel Trilby is serialized in Harper’s Weekly. 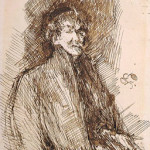 One of the characters, described as “the Idle Apprentice” resembles Whistler. Annoyed and thin-skinned, he protests. Harper’s apologizes and Du Maurier softens the references. Whistler has now become the subject of caricatures and cartoons, even a character in the Gilbert & Sullivan operetta Patience. 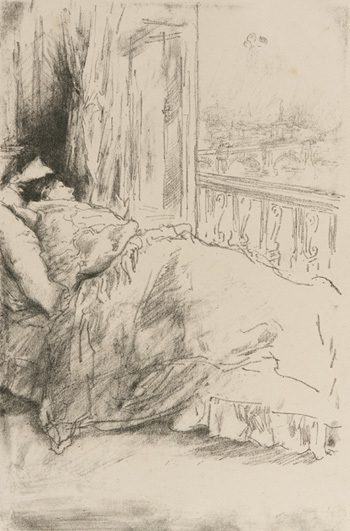 December, 1894 Beatrice is unwell; Whistler’s brother, a physician, comes to Paris and makes the diagnosis. 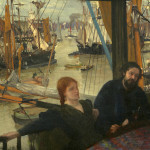 Whistler takes her to London for medical treatment. 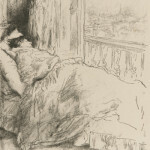 “Siesta,” 1894, lithograph, courtesy National Gallery of Art. January, 1896 The Whistlers take a room in the Savoy Hotel; Whistler works on lithographs of London, but never strays far from the hotel. She will die of cancer in May at age 38. The impact on Whistler is profound. He ages visibly after her death. He quarrels with his oldest friends, seeking refuge from grief in a series of conflicts. 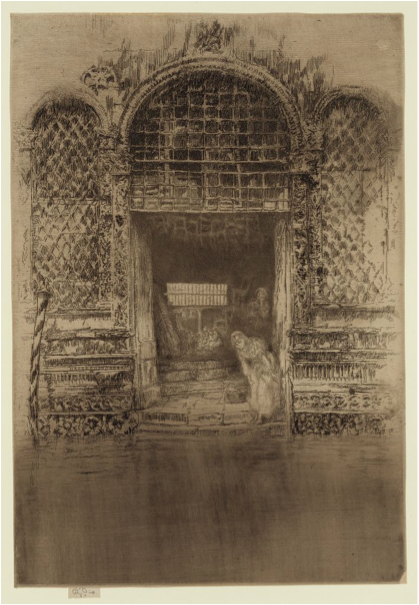 “By the Balcony,” lithograph on paper, courtesy of the Freer|Sackler Galleries of Art. September, 1898 Whistler’s own health is now poor; he works on a series of self-portraits and opens a short-lived art academy in Paris with a former Whistler model. 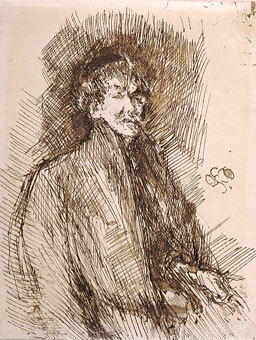 “Self Portrait by Whistler,” drawing, pen and brown ink, courtesy of the Library of Congress. “Nocturne,”1878, Lithograph, courtesy National Gallery of Art. 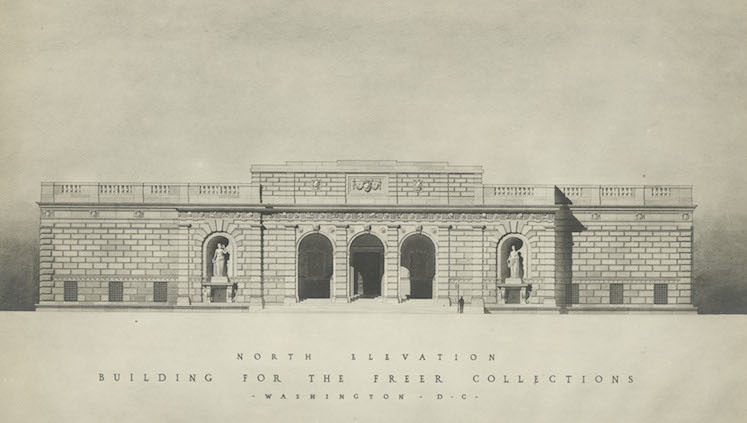 “Freer Rendering,” 1923, Charles Platt, Architect, courtesy Freer Gallery of Art and Arthur M Sackler Gallery Archives. April, 1903 Whistler receives an honorary Doctor of Laws degree from the University of Glasgow, but is too sick to attend the ceremony. On July 17th, Whistler dies and is buried in Chiswick Cemetery, London. Orville and Wilbur Wright make the first successful airplane flight in Kitty Hawk, North Carolina. 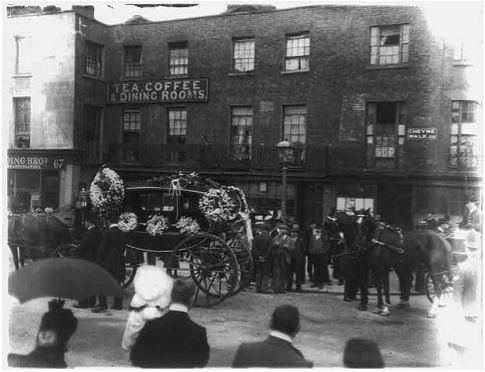 Whistler Funeral Procession, courtesy of the Library of Congress.